Preheat the oven to 350°. Put the walnuts in a pie plate and bake for about 5 minutes, until lightly toasted and fragrant. Let cool, then coarsely chop. Bring a large pot of salted water to a gentle simmer. In a medium bowl, stir together the cheese and heavy cream and season lightly with salt and pepper. On a work surface, lay out 4 wonton wrappers and moisten the edges with water. Place 2 teaspoons of the cheese filling in the center of each wrapper. Top with 4 more wrappers, press to remove any air pockets and then press well around the edges to seal. Transfer to a lightly floured baking sheet and cover lightly with plastic wrap. Repeat with the remaining wrappers and filling. In a medium skillet, cook the butter over moderate heat until it just starts to brown, about 5 minutes. Remove from the heat. Add the ravioli to the simmering water and cook until just tender, about 2 minutes. Remove from the heat. With a slotted spoon, carefully transfer the ravioli to a large platter and blot dry with paper towels. Reheat the butter, letting it boil over moderately high heat until richly browned. Add the marjoram leaves and let wilt, about 5 seconds. 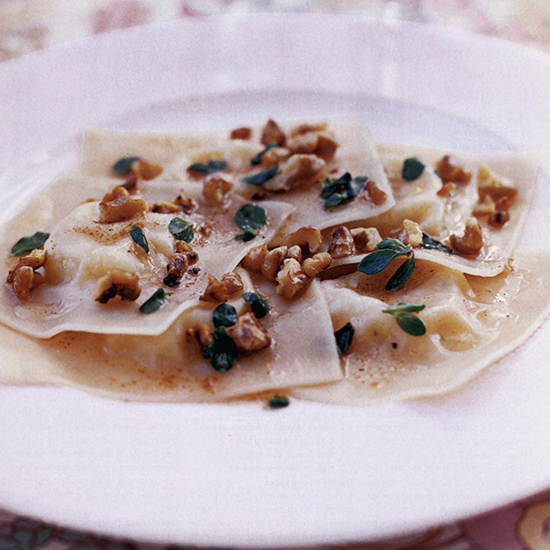 Pour the browned butter over the ravioli, sprinkle with the toasted walnuts and serve right away. The assembled ravioli can be covered with plastic wrap and refrigerated for up to 4 hours. Try a full-bodied, well-textured Italian white blend.